"The Copley Society of Art New Member's Show...also rocks when faced with the portraits of Adrian Tans, absolutely the highpoints of the show. 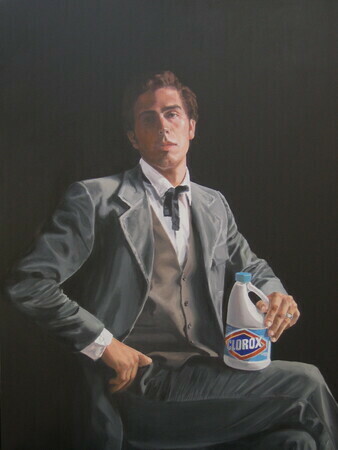 First one must tip the hat to this self-taught 30-year-old for his old-masters-like handling of paint, paying homage to the likes of Velazquez and Sargent, but it is the content implied in the works like "Portrait with Clorox" that make these pieces showstoppers....[his] works are mesmerizing and courageous, fresh and skillfully rendered. Self-taught? Wow." Awarded anually to one emerging artist by the Copley Society's young art collectors group, The COSO Circle. Director's Choice: "Portrait of Fredrick Dowalo"
Honorable Mention: "West Main Road"
A self-taught artist, Adrian Tans enjoys working in a variety of styles creating work shown in his own Lincoln Bond Fine Art Gallery, as well as galleries throughout New England. He is a member of both the Copley Society of Art and the Cambridge Art Association. In addition, Adrian is a member of the SCBWI (Society of Children's Book Writers and Illustrators). He is the illustrator of four published children's picture books, The Emperor's Army by Virginia Walton Pilegard, Kick the Cowboy by Joe Gribnau, Pirate Treasure Hunt by Jan Peck, and Witches' Night Before Halloween, by Lesley Bannatyne (), (see the News tab for details). Adrian also works in graphic illustration large and small for original logos, signs and the like, on site or for reproduction. As a hobby, he enjoys competitive public art such as snow sculpting with his teammates, the Vermont state champs, sand sculpting, and large chalk-art street competitions.